Whew! My fingers and keyboard are still smoking after that long series on Cylindera celeripes (parts 1, 2, and 3). Exciting as my celeripes finds were, there were other “tiger beetle moments” from the Oklahoma trip as well that I want to highlight in future posts. However, I thought I’d give everyone a break from tiger beetles (and my rambling prose) and remind everyone that I can not only talk about other insects, but even non-insects. Isn’t he a looker?! I came upon this this male eastern collared lizard (Crotaphytus collaris collaris) during my first day at Four Canyon Preserve – fitting, since the species is Oklahoma’s state reptile (a fine choice, unlike their dreadfully pedestrian choice for state insect – the honey bee! Huh? It’s not even native!). When I first saw this fellow he skirted under a branch, then across the trail, under a ledge, up and over to another rock… By the time I got him accustomed to my persistent approaches (remember, I stalk tiger beetles!) he was posing nicely at chest level and with the sun behind my shoulder for a nice series of photographs. I have never been able to approach a “mountain boomer” this closely before (encountering them only a few times previously on igneous glades in the the St. Francois Mountains of my beloved Ozark Highlands), and the first time I do I have a Canon 50D and 100mm macro lens in my backpack – que suerte! Perhaps my title is a little presumptuous – surely there are other gorgeous lizards in North America. 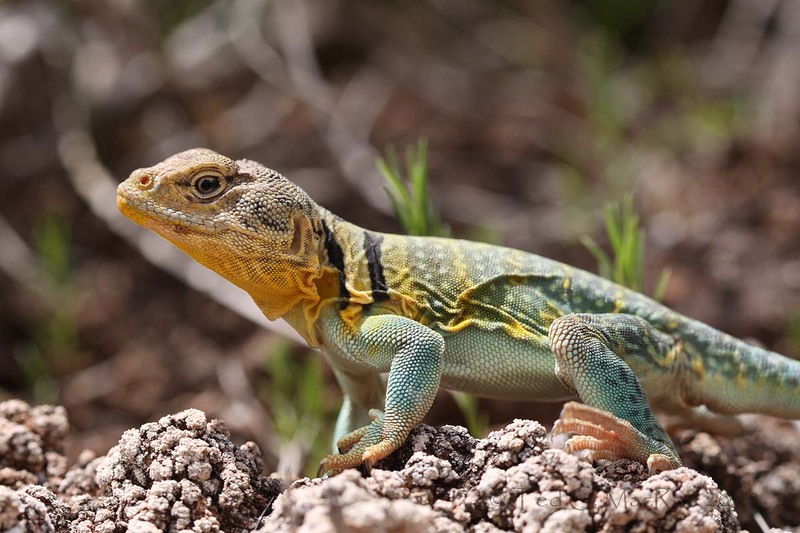 However, I can’t imagine anything more breathtaking than the vivid blues, greens, and yellows with sharply contrasting black stripes of male eastern collared lizards. Perhaps the gila monster might get a vote, although its impressiveness is more grotesque than beautiful. Horned lizards as well are quite impressive, but again more bizarre than beautiful. 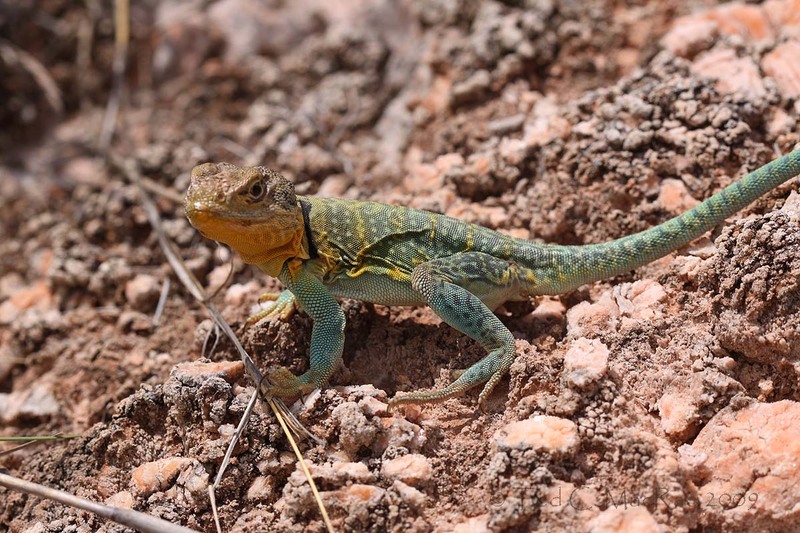 Added to the collared lizard’s visual appeal is their comically dinosaurian ability to run swiftly on their hind legs with the fore legs and head held upright (this is how most of my previous attempts to approach them have ended). The name “mountain boomer” probably originated with the early pioneers, who erroneously believed that they emitted sounds that echoed through the canyons and valleys. An oft-cited theory in field guides (and also the Oklahoma Department of Wildlife Conservation and the Missouri Department of Conservation websites) states that the pioneers may have associated the sunning lizards with the barking of frogs. This seems unlikely; frogs that make barking noises are creatures of wetlands – far from the rocky outcroppings of the glades and pinyon-juniper, sagebrush, desertscrub, and desert grassland habitats of the central and west-central U.S. where collared lizards are encountered. 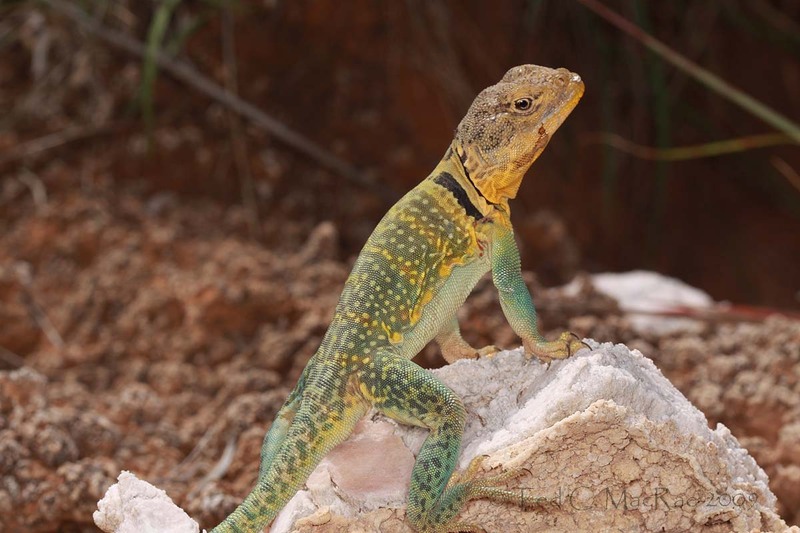 Regardless of the source of its nickname, collared lizards in reality make no vocalizations at all (although like most lizards they can hiss when they feel threatened). This entry was posted in Reptilia and tagged Great Plains, herpetology, lizards, nature, North America's most..., Oklahoma, prairies, reptiles. Bookmark the permalink. What a beautiful creature! Nice shots, Ted! Thanks, Kolby. 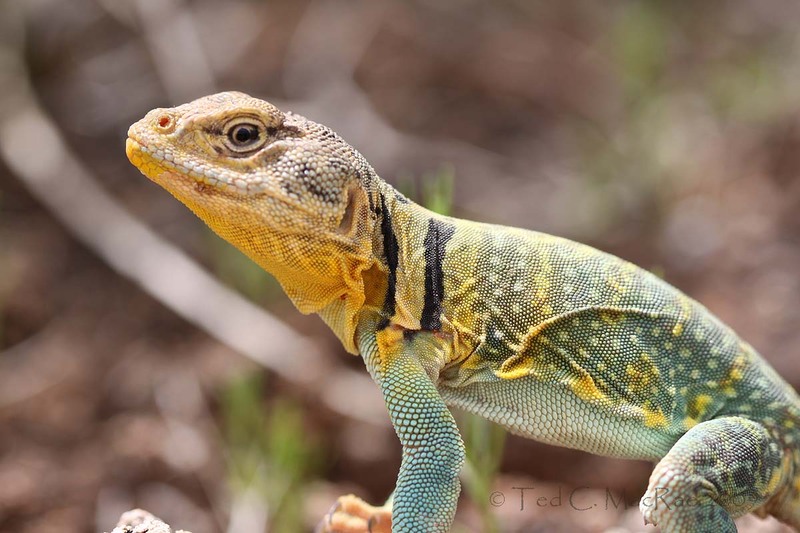 I saw your western collared lizard photo – quite spectacular as well. Please credit Ted C. MacRae and provide a link back to this site. Thanks! That little fellow is absolutely amazing Ted!! It looks like he was put together in so many different parts. I saw another male later in the day, and I was able to approach him rather closely as well. I figured I had as good a photo as I was going to take, so I just watched him for awhile. They are truly gorgeous! A very colourful lizard. Nothing like that over here in Australia – all drab coloured! Nice shots. Keep up the great field studies and photography. Thank you, Trevor. I can only take partial credit for these photos, since I had just set the camera to automatic mode and let it pick the aperature and shutter speed. We have some other colorful lizards, but none really this large and spectacular. really it’s a beautiful lizard! Thank you, macro – I’ve seen some rather gorgeous reptiles on your site as well. Gorgeous lizard. Your photos are beautiful. I see you’re making fine use of your new camera gear- these are some lovely images! Thank you, Alex – a fine compliment considering the source. Very nice pictures with a lot of great detail. And, ahem, I heartily approve of the inclusion of lizards in blog posts–the more the better. Thanks, Kirk. Yet another testament to my lack of focus! Nice pics. I’ll bet you are glad you didn’t see one try to run down a tiger beetle! 😀 That would have been a quandry! Indeed, perfect shots of the lizard. Keep that camera on automatic and keep looking for those darned beetles. Thank you Steven, but I have to admit to throwing away twice as many shots that didn’t turn out so well. I guess that’s the beauty of digital – shoot a ton, keep a few! Still, I’d like to get a little better at actually knowing what I’m doing. Wow! My beloved mountain boomers from childhood days in Oklahoma. Great shots! Thanks for the bug book recs! Wheelbug nymphs have been identified….onward. So, you’re an Okie, huh? (My apologies if this term is not actually not appreciated by Oklahomans.) It took me 40 years before I saw my first boomer. My pleasure with the bug book recs, and glad to hear they have resulted in a successful ID. Don’t get too careless with those wheel bugs – they can bite something aweful! Great photos Ted! These collared lizards are one of my favorites also and occur down here in my Arkansas Ouachitas as well as Ozarks. Glad you had the right gear with you when you saw this beautiful creature! Keep up the great stories as I certainly enjoyed your exploits looking for beetles in OK and MO. Thanks, Henry – I appreciate the kind words. I’m still amazed at what a good look I got of these guys. I should have tried to get a close up photograph of his eye – just to see if I could. Great shots of a beautiful creature. We do have them (and I’ve seen them) in Missouri, but I’d never gotten as good a look at one as this. I enjoyed your HoH submission as well. This is a beautiful lizard. Makes me want to visit Oklahoma (or wherever else they roam). He is a looker, isn’t he? Since I’ve started exploring the Great Plains, I’ve been enormously impressed with its natural history. I’ve seen a lot of great things in Oklahoma, Kansas, and Nebraska the past five years. Okay, we’re oogling. How in the world do you manage to regularly find creatures that are so darn spectacular looking? Sheesh! Every time we come to your blog we’re dazzled. Thanks Cici, glad you like them. They must be interesting lizards to watch. Still, it would be fun to be able to claim to have been bitten by a collared lizard! Camping in Sand Springs, OK this weekend and these lizards were everywhere. So nice to come home and pull up a great picture to use for identification. Thanks!